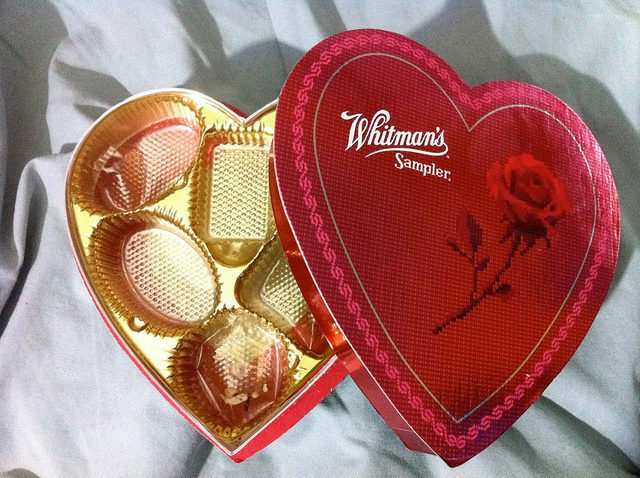 Heart shaped boxes are in a sorry state. In this study, they asked over a thousand people about their eating and exercise habits, evaluated their BMIs (Body Mass Index, a ratio of height to weight) and mood, and most importantly asked the age-old question, “How many times a week do you consume chocolate?” (More than you’d like to know, Researcher. More than you’d like to know.) As you might expect, they found that people who ate chocolate more frequently consumed more calories overall, including more saturated fat, and had higher rates of depression. But they also found that people who ate chocolate more frequently had lower BMIs. (Emphasis is theirs. Even they were so surprised by this that they had to add italics.) They found no link between chocolate eating and exercising. What’s really remarkable about this is the issue of calories. There’s an idea that a calorie is a calorie, meaning that no matter what you eat, if it adds up to more calories, you’ll gain weight. Of course that’s overly simplified. Studies show some calories are better or worse than others: protein has been shown to keep you lean, monunsaturated fat to reduce your risk of heart disease, trans fat to raise your risk. Most people would put chocolate in the bad calorie column; it’s full of sugar and fat. But this study suggests it’s not so bad; that a chocolate calorie isn’t just a (delicious!) calorie. Even though chocolate lovers ate more calories, they were still thinner. The authors cite other studies that have found chocolate helps regulate insulin sensitivity, blood pressure, and cholesterol levels. Maybe these advantages of chocolate offset the sugar and fat. The authors finish by concluding that a randomized clinical trial of chocolate may be needed. Count me in! Unfortunately, the researchers didn’t ask about the type of chocolate. Dark chocolate gets all the good press and is getting more popular, but considering the ubiquity of milk chocolate products in our supermarkets, I can’t imagine these people were eating only dark chocolate. It would have been interesting if they had included that distinction, especially if it gave some credit to poor old milk chocolate. An interesting recent study investigated the link between hormones released before and after an exercise intervention and the amount of food eaten. The hormones studied (CCK, obestatin, GIP, and leptin) help to regulate your eating; CCK and leptin tell you to stop eating, GIP tells you to eat more. (Obestatin's role remains controversial.) Obesity may disrupt these hormones' ability to accurately regulate food intake. For example, some obese people have high levels of leptin but seem resistant to its effects. (Leptin should decrease eating.) Some evidence suggests that exercise can help get these hormones back in check, which should help prevent overeating and improve weight loss. 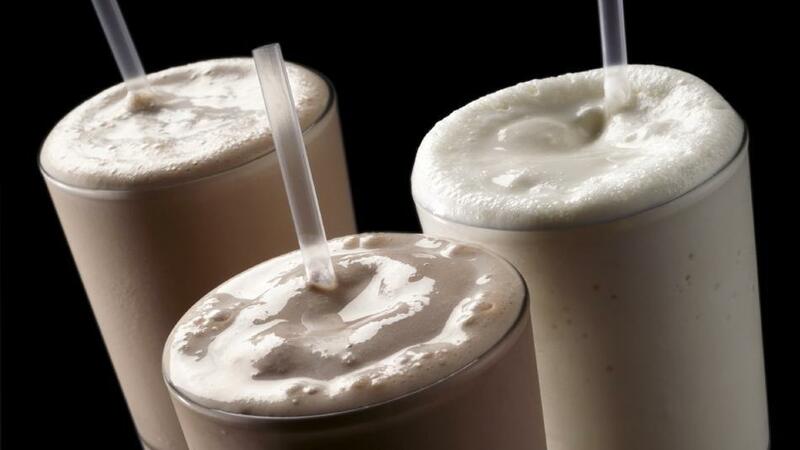 these milkshakes? Can your body? In this study, both male and female overweight participants underwent a 12 week exercise program. Before and after the program, hormones levels were measured after fasting overnight and then directly after breakfast. Other days, participants were given a milkshake and then treated to a pasta lunch. (Milkshakes and pasta? Count me in!) The amount of pasta eaten and the amount of food consumed for the next 24 hours was assessed. The trick was the milkshake: one day it was filled with malodextrin, a mostly flavorless substance that more than doubled the calories. Another day malodextrin wasn't added. The researchers asked how the milkshake affected the rest of the day's eating. Will the participants' bodies sense the extra calories and eat less after the megacalorie milkshake? Will an exercise program help? First of all, the participants lost weight in the exercise program. That's an important note because it's more evidence that exercise can lead to weight loss, even though the participants were told to maintain their normal diet throughout. After the exercise intervention, leptin levels were decreased during fasting and remained decreased after a meal. This may seem counterintuitive, but leptin decreasing with exercise may help the body become more responsive to its effects. (Remember, obese people may have too much leptin and be insensitive.) The milkshake and pasta lunch combination didn't change after the exercise program. Both before and after the exercise program, the participants ate less pasta after the megacalorie milkshake than after a normal milkshake. However, their food intake over the course of the day changed: after the exercise intervention, the mega milkshake led to less food eaten the rest of the day. (Prior to the intervention, the mega milkshake actually led to more food being eaten the rest of the day, see graph below.) This indicates that the exercise program helped to regulate the body's ability to count calories. It's not that exercise makes you eat less (the days with a normal milkshake had increased food intake compared to days before the exercising, compare hatched bars below), but that your body is better able to judge how much you're eating and when you've had all you need. 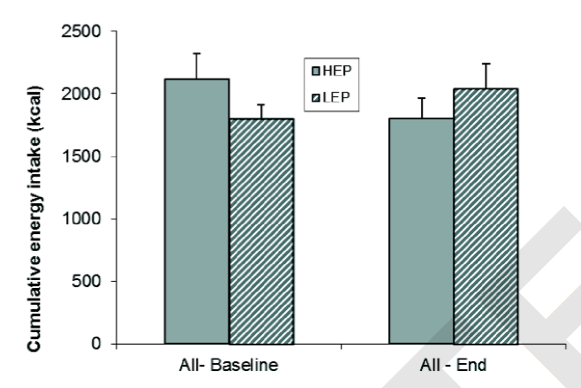 Before the exercise program ("All-Baseline," at left) the participants ate more after the mega milkshake (HEP, solid bars) than after the normal milkshake (LEP, hatched bars). After the exercise program ("All-End", at right), they ate less all day following the mega shake. It's important to note this study looked at participants who were overweight to start with. Previous studies on this subject tested normal weight people, which isn't as relevant to the population of dieters these studies aim to help. The good news for people trying to lose weight with exercise is that exercise may get your body to help out, by teaching it to better regulate eating. Lastly, the study is an important reminder to know what you're eating. Restaurants (and researchers!) can trick you into consuming way more calories than you may be aware of. This study suggests your body might be able to compensate to some degree, but do yourself and your body a favor and eat fresh and homemade whenever possible!